Opera on Tuesday released version 10.5 of its Web browser, claiming it's the fastest browser available for the Windows operating system. Opera 10.5 includes a new design and private browsing options, and arrives just in time for the arrival of the controversial browser ballot screen in Europe. Opera 10.5 arrives as Microsoft rolls out a new browser ballot screen on Tuesday to over 200 million Europeans. The ballot screen is supposed to make it easier for Internet Explorer users in Europe to switch browsers. Opera currently has a 1.78 percent share of the worldwide browser market, far less than Microsoft's IE commands. The first thing you will notice about Opera 10.5 is the refined interface, with a new Opera menu button that replaces the traditional menu bar. 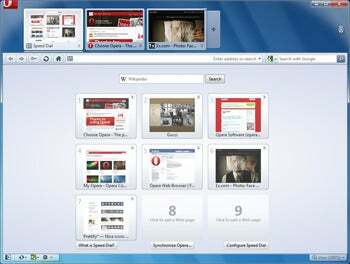 Tabs and open windows in Opera 10.5 work similar to the way they work in Google's Chrome browser, and it also features integration with Windows 7 Aero Glass, Aero Peek, and Jump lists. Another major addition to Opera 10.5 is the private browsing option, with a twist. Unlike Google Chrome or Apple Safari, Opera 10.5 lets you browse privately -- and not only in a separate window, but also in a tab. An oversight from Opera though is the lack of simultaneous launch of versions for Mac and Linux machines, which the company says are "coming soon." Opera 10.5 is now available for download.